Oversized loads need big vehicles for the delivery purpose, that's when you need special vehicles. We have a range of trucks equipped with cranes to help you lift and deliver your goods safely. 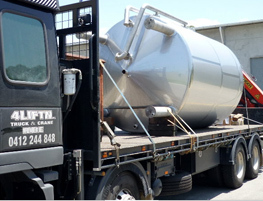 You can choose the right truck for your items and project needs at 4LIFTN. We provide special trucks for big and heavy loads such as Crane Trucks, Table Top Trucks, Semi-Trailer Trucks, and Tray Trucks. They are all in good conditions and quality materials, we also provide qualified operators to help you with the vehicles. Contact us today and our staff will be happy to help you picking the right vehicles for your projects. Remember, big loads are valuable, you shouldn't carry them in a careless manner. Leave it to professional teams and have it delivered safely to its destination.